For two hours I skied on untracked snow. Do you know how rare is that at Bogus nowadays? Unfortunately, I had to get back down to Boise by 1:00 PM and co-teach the Avalanche and Snow Physics class being offered at BSU. Tomorrow an Avalanche Level 1 course starts at Mores Creek Summit. Thus I visited Pilot Peak today to gauge the snow conditions and prepare tour plans for the avalanche course. The next video summarizes some of the snow conditions we encountered today at Mores Creek Summit, in the area known as Top of The World. Chago20180315 from Santiago Rodriguez on Vimeo. Not bad skiing, not bad at all! We spent the day skiing Top of The World, where we found as much as 15 cms of new snow in the top of a rain-soaked crust. The new snow at Top of the World was sufficiently dry but creamy/dense to keep the ski edges off the underneath wet crust. Air temperatures were pleasant, in the - 4 Deg-C with light south winds. No evidence of storm, persistent, or wind slab was observed. I must admit that I was expecting the usual MCS snow dump. 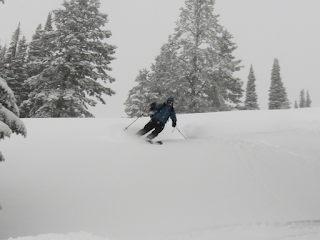 When Bogus gets snow, MCS always gets more - a lot more! That was not the case with the latest storm.😞 Early in the morning, I checked the MCS Snotel and the site has received approximately 3.3 cm of SWE (Snow Water Equivalent). Assuming 10% density snow, that could have been as much as 33 cms of snow. The snow depth sensor for the MCS Snotel was not reporting values this morning, thus I had no means to estimate storm snow totals. It turns out that probably half of the 3.3 cm of SWE precipitated as snow at elevations as high as 8000 feet at MCS peaks. Bogus Basin Road - 5800 feet elevation. As the day progressed we kept our hope that the persistent fog will clear and the sun will come out. Instead, nature only gave us limited moments of cloudy skies without fog. 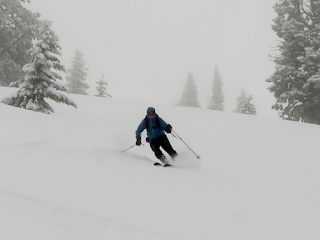 The next sequence shows Eric skiing during today's "flat light" conditions due to fog. For folks that are reading this blog and that are new to the area, you should consider participating on one of the various avalanche or introductory backcountry skiing courses offered at Mores Creek Summit. Not only will you learn about safe travel in avalanche terrain, but you be will mentor about the best places to ski at Mores Creek Summit. Avalanche Science's course participants are limited to a small number of participants. Not only that improves the learning outcomes, but you get to do a LOT of skiing for three days. Check avyscience.com for courses scheduled for this month. A few days ago I shared the following write up about Reliable Partners at Avalanche Science FaceBook page. I include the FB post as closing remarks for this post. Though topic to write about it. I have been doing a lot of thinking about it ... and I will be soon making a blog entry about it. A reliable partner is not only a companion that reliably contributes to a trip planning, but also is a well-trained rescuer. In order to be an effective partner during trip planning, it is essential to be exposed to 'situational awareness' and 'decision making' principles related avalanche terrain travel. Perception of the environment, key in situational awareness, demands to understand the avalanche problem at hand as well as being familiar with human factors (biases, syndromes, group tactics, among others). 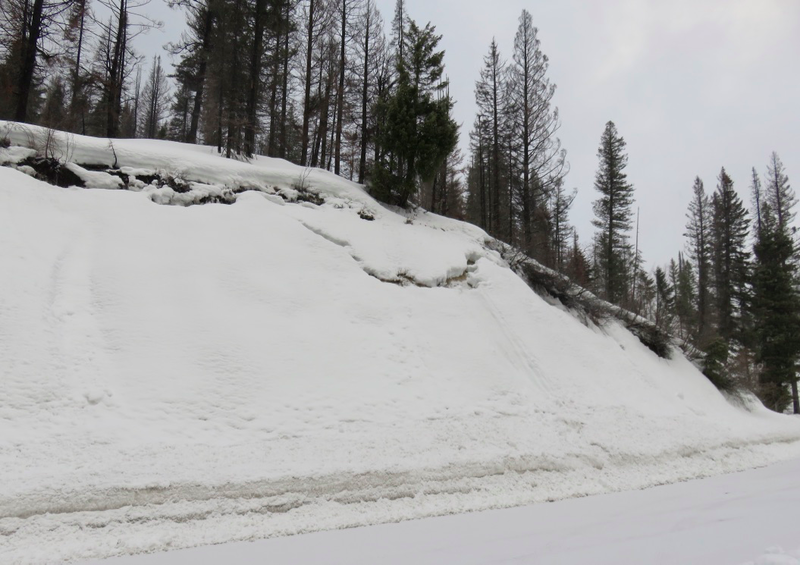 But situational awareness also requires comprehension of the elements (avalanche release, snow metamorphism, the impact of weather factors in instability) to anticipate avalanche danger. Assessment of avalanche danger is a key ingredient to generate ski touring plans where risk is mitigated through the selection of appropriate terrain for the day conditions. Avalanche Level 1 courses are designed to provide participants with the fundamentals of Situational Awareness and Decision Making in Avalanche Terrain. But a reliable partner also needs to be a competent rescuer. During Avalanche Science courses every participant has to demonstrate that they can reliably perform a single victim rescue (50-meter area, 1.2-meter depth) in less than 5 minutes. The demand from Boise skier community for Avalanche Courses at Mores Creek Summit has been disappointing. It is true that there are other local providers that do a terrific job teaching the principles outlined above. 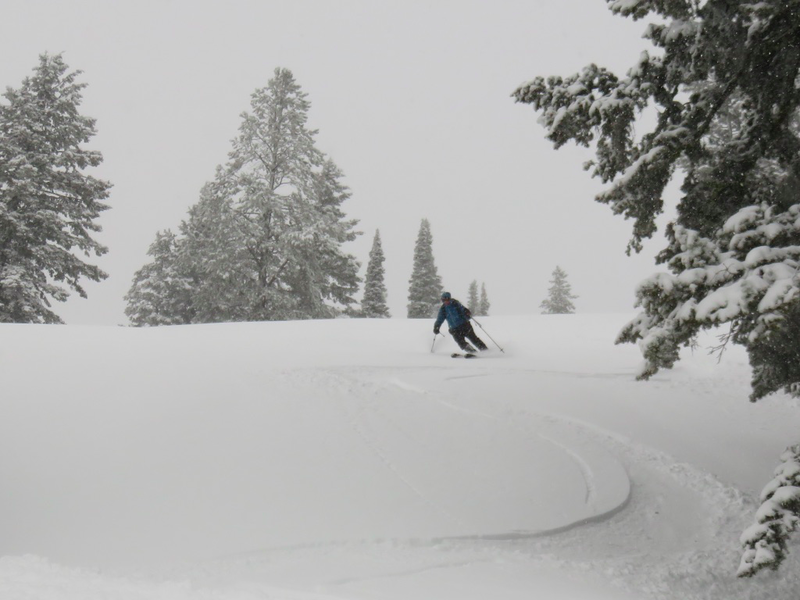 However, there are a lot more skiers in Boise accessing the Idaho backcountry that it is possible to accommodate through local providers. So I need help understanding why The Boise Backcountry skiers are not taking the opportunity to take avalanche courses at Mores Creek Summit. Why not become Reliable Ski Partners? 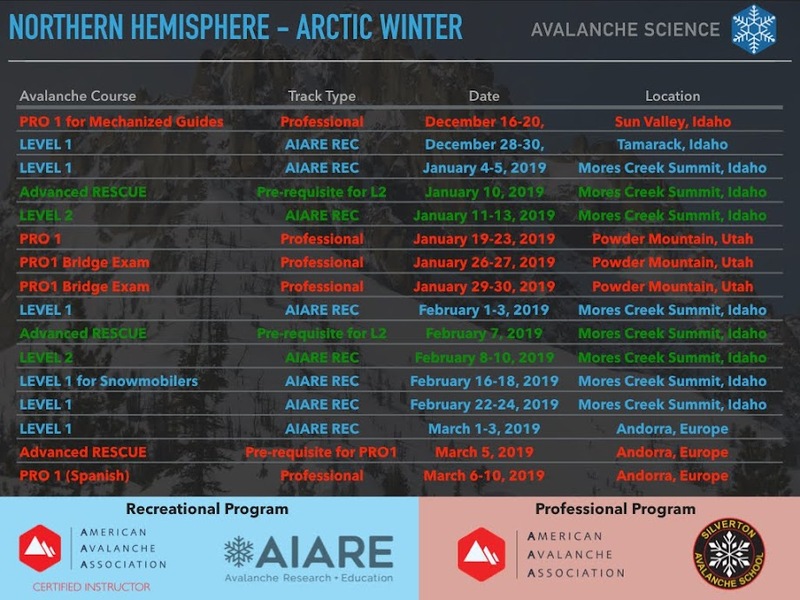 Visit avyscience.com for avalanche courses at Mores Creek Summit. Life is good with POW turns and face-shots! Saturday, March 17-208 - Face Shots Day at MCS!